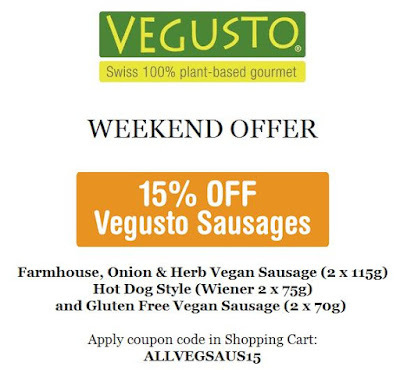 The Vegan Magpie: Vegusto Sausage offer! Hello! Super vegan meats and cheese company Vegusto have yet another excellent offer running this weekend. Until midnight Monday 17th July, you can get 15% off their farmhouse, onion and herb sausages, hotdogs and gluten free sausages (not the pepper sausages)! Something for everyone! Just enter the code: ALLVEGSAUS15 at the checkout. Just head here: https://vegusto.co.uk/sausages-burgers and get shopping! Don't forget to factor in delivery costs when ordering.